If you don’t have a story of losing your data or having it stolen then you know someone who does. Have you ever found the ultimate webpage, closed the tab and cleared your history only to look for it later? Often, you won’t find this easy. That illustrates how hard it is to keep track of your data. All these problems can be solved if you organize your computer’s folder structure, file labeling and backup system. Join me as I show you how I do it so you can walk away squared away. Prefer delivery? Join the Hexie Dose Newsletter and I’ll send you updates. 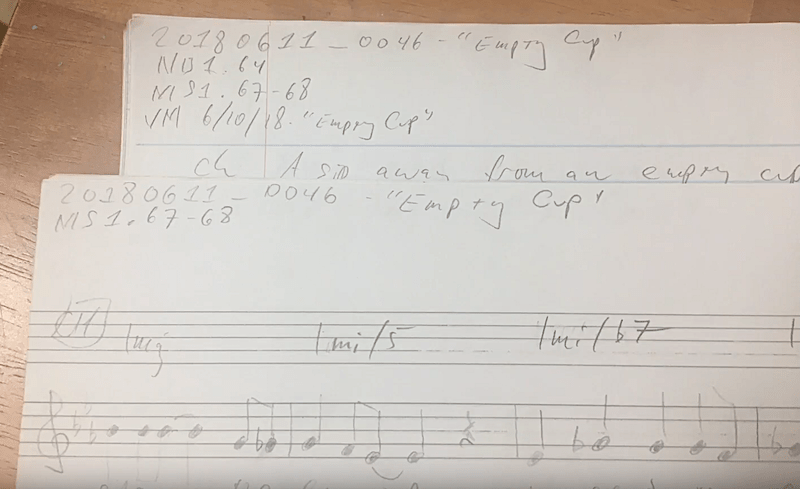 Songwriting Quick Tips – Subscribe to watch all 100+ parts (coming soon). 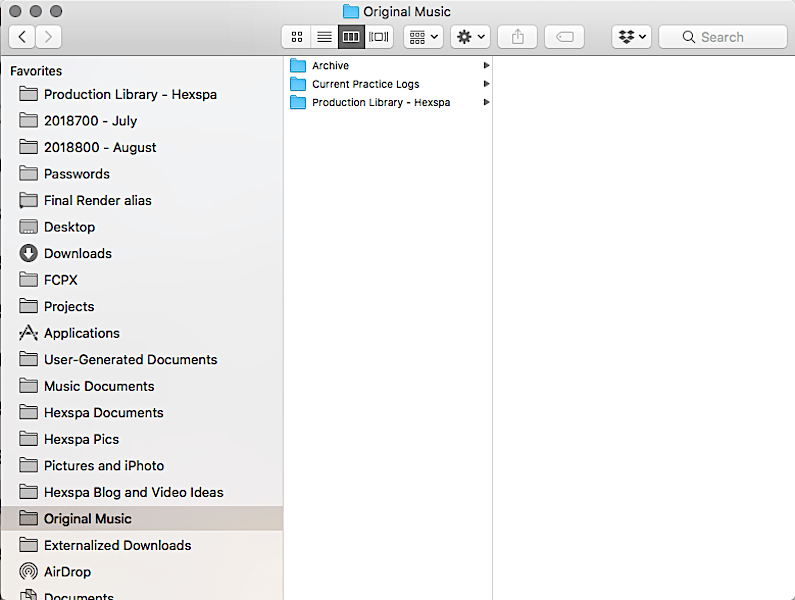 Original Music global folder and its three sub-folders. The contents of the Archive sub-folder. 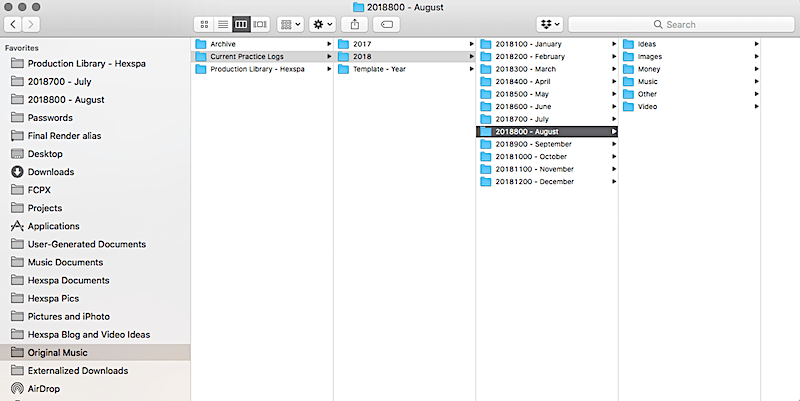 Here you can see the details of how I organize my files by year. 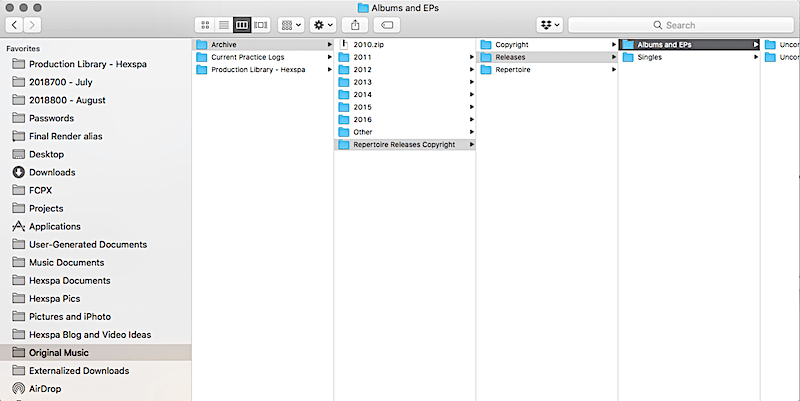 Every yearly folder links to its constituent monthly folders. The nomenclature I use, which I’ll explain in further detail later, is YYYYMM00. I append two zeros to the end of my monthly folders because I organize them by name and, if I don’t do it, they won’t line up chronologically. Ideas is for keeping notes I take whenever I’m feeling inspired. Images hold cat gifs, screenshots, and fine art n3Wdz. Money is something we all need. You’ll organize your receipts here. Music is special and contains: Analysis, Originals, Other, Practice. Other basically functions as my /b/, i.e. Random section. Video gets video practice and assets. Big projects live elsewhere. Please examine the image above. 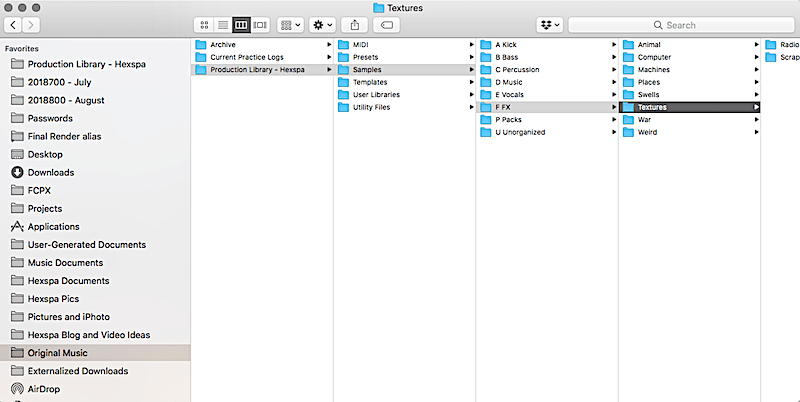 The Presets folder has two sub-folders: Synths and FX. The only thing I’ll add is that, based on what you make, you can organize these folders differently. At the same time, try to appreciate the value of each folder I’ve shown. Pictured: Notebook 1 and Manuscript 1 for “Empty Cup”. For these tomes, I abbreviate the book name and also include the page number. Then I copy that ledger entry into its companion. If you want, you can relay this information in your digital versions as well. If I’ve made a voice memo recording of the session, I use the abbreviation VM then add the date in MM/DD/YYYY format and the title last. While this is different than my year-first convention, it mirrors the Voice Memos app format. As I alluded to in the beginning of this post, data gets lost, stolen, and misplaced. You always think it won’t happen to you until it does. Let me encourage you to back up your data. Before you do that, make sure you organize your files in a coherent way. By doing this you’ll be off and running should you have to replace just a segment of your information. They say you need three copies so that’s your original drive, a backup drive, and an off-site backup. For my external drive, I use an encrypted HDD. I actually don’t know whether it’s 5400 or 7200 RPM but, for backup, you can use a slower platter. They’re internal drives wrapped in an OWC Elite enclosure and connected via USB. I use Backblaze for my off-site storage. Having never needed to restore my data, I can’t tell you whether they’ll work. Even so, their background task is unobtrusive and if you’ve messed up your payment, they don’t instantly delete your data. When I was shopping for options, I wanted video backup and they do it so I went with them. Click the affiliate link to get a free trial. Paper air planes are origami, right? What makes a good plane? I have no clue but making sharp creases probably helps. That will segment your parts, making them functional and sharp. I heard someone say that their brain is like an Etch A Sketch in that, once created and subsequently erased, you never get it back again. Since many of us are disjointedly scatterbrained, do yourself a favor and do three things: organize your files, label consistently and backup your data. Thanks for reading. If you don’t know, I’m Michael Carrillo, aka Hexspa, and I make music. Should you be feeling frisky, check it out my sounds here. You can also join my Hexie Dose Newsletter to get free stuff every month. I publish every Monday 4PM, PST so come hang out next week for more tunes, treatises, and tutorials.